Wild creatures in the forest usually run away when humans approach. 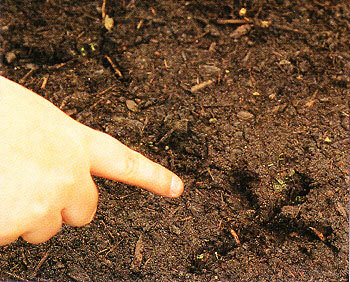 However, you can learn a lot about birds and other animals by looking at their tracks. You could go to a wood with an adult to hunt for animals tracks on soft or wet ground . the banks of streams and rivers are often criss-crossed by prints from animals who have gone there to drink. 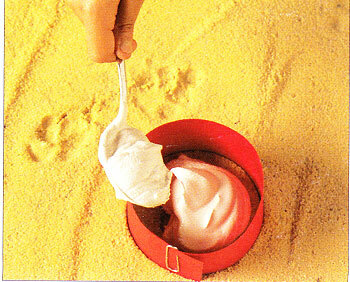 Different groups of animals (mammals, birds, reptiles, and amphibians) leave diffrent tracks. The frist project shows you how to look for these prints. 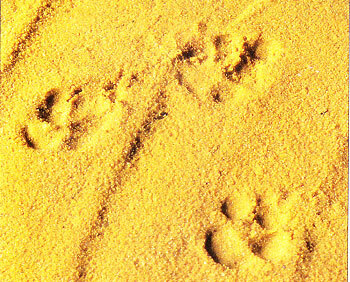 Tracks give clues about the size and weight of the animal. They also show how animals move- whether they run, hop, slide or slither. Large , heavy birds for example, such as geese, waddle along- shifting their weight from side to side. 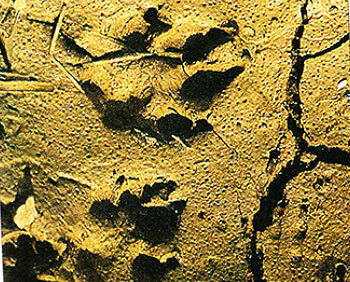 Their prints show that they place one foot in front of the other and slightly to the side, rather like the way humans walk. Small birds, such as sparrows and finches, hop along on thin legs and feet. They leave tracks of tiny prints running side by side. Draw the prints or take a photo graph, and record in a notebook the date and place , ground conditions, and other abservations. 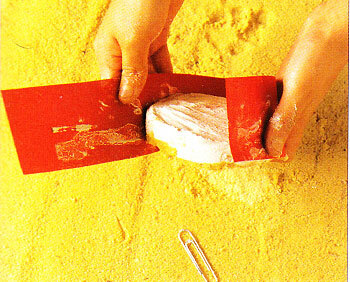 The second project shows you how to make casts of the most interesting footprints. Magnifying glass, camera, notebook, pencil, field guide. 1. When you find a footprint, count the number of toes. Can you see any claws? A fox’s paw is rounded , with four toes and claws. Take photos or make drawings of animal tracks you see. 2. Deer have narrow, splits hooves with just two toes. They leave deep tracks, because they walk with all their weight on their toes, rather than evenly spread throughtout their feet. 3. Most birds have long, spindly feet, with either three or four toes . All ducks and some wading birds have webbed feeet. The web shows up in the outline of the print. Protective gloves, field guide, card, paper clip, plaster of paris, water mixing bowl, spoon, trowel, scrubbing brush, paintbrush, paints or varnish, water pot. 2. Look for bird footprints in wet sand or mud. Tracks show the size of the bird that made it, and what group to identify the bird that made the print. 3. 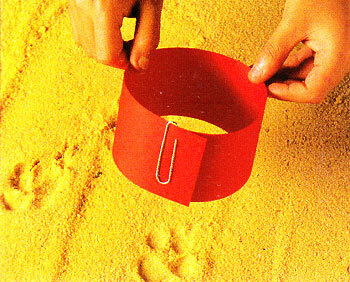 Bend a strip of card into a ring large enough to fit around the print, and fasten the card ring with a paper cflip. Place the ring over the print. 4. 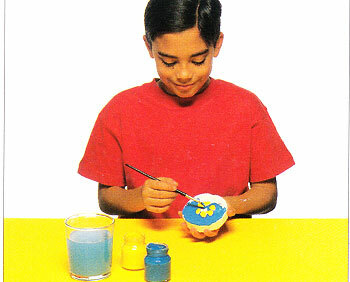 Mix the plaster of Paris with a little water in a bowl, according to the instructions on the package. Stir the mixture until it is a thick and even paste with no lumps. 5. Carefully spoon enough plaster of Paris onto the print to cover it completely . After 15 minutes , the cast will be dry enough for you to pick it up. 6. Use a trowel to prize the cast loose. Carefully peel off the paper ring. 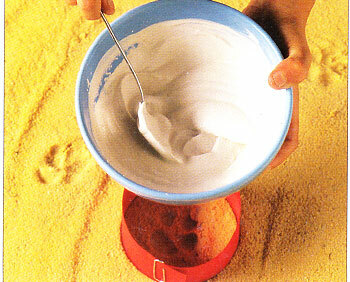 Clean up the cast by brushing off any lose soil or sand with a scrubbing brush. 7. Allow the plaster cast to dry for 24 hours. After this, you could paint or varnish the cast . 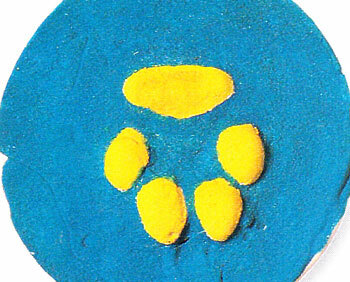 Try painting the raised footprint one color and the background another color. Finished casts of dog footprints.